Those interested must talk to Pastor Tom Mooney or Stephen Jarrett to fill out an application, if there is an opening. How it works, Monday through Thursday when our “Back Gate opens at 9:00 AM”, candidates for the Drug and Alcohol program will go up to the mailroom window and tell the program man they are interested in the Program. He will write their name down. It is “First Come, First Serve”. 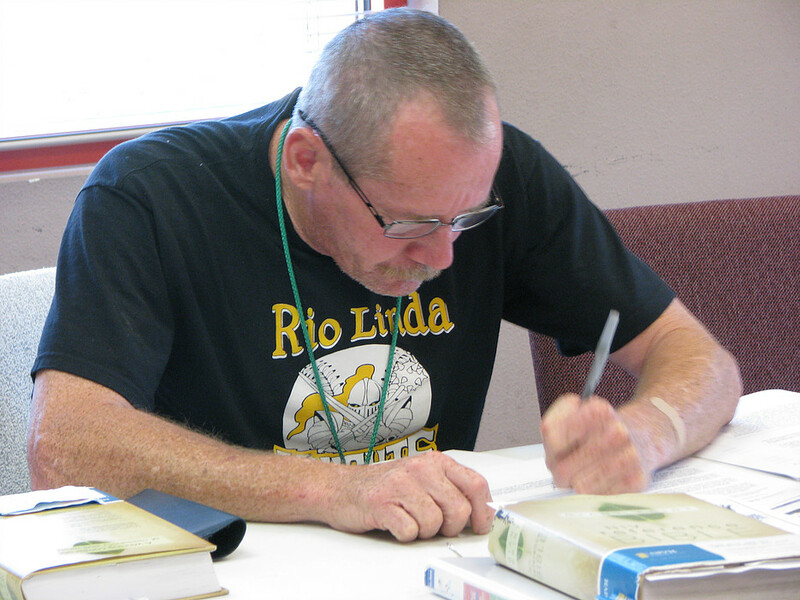 When the staff is finished with morning prayer service (around 10:00 AM) they will have all those that are interested in the program to come in and fill out an application that will give the staff more understanding. The candidate will talk to three staff members, two being Pastors. If candidate is accepted into the program, the following is what they can expect. Titus 2:11-12, For the grace of God that brings salvation has appeared to all men teaching us that, denying ungodliness and wordly lusts, we should live soberly, righteously, and godly in the present age. This is a NON-SMOKING and NON-CHEWING Facility. Program men cannot Smoke or Chew on or off grounds. Any Racial bias or disruption you will be DISMISSED! We are all children of Christ! Street language, Prison language, NO sagging, Gang activity, reference or conduct and Profanity is not tolerated! Fighting is not tolerated and one or both parties involved are subject to dismissal. Substance abuse and a Breathalyzer tests can be administered at the discretion of the staff. This is a “ZERO” tolerance program. If you use drugs, alcohol, smoke or chew while on this program you will be asked to leave. The Mission does random drug testing. Refusal to take a test or Failing a test will also result in dismissal. – You have been on the program for thirty (30) days. – You are current in your program assignments. – You are not currently assigned a Yellow Disciplinary or Pink Probation Badge. OUTSIDE CHURCH ATTENDANCE is allowed and required for program men who are Blue Badges and have been on the program six months or longer. MUST be back on UGM Grounds NO LATER than 4:00 PM. No other activities are allowed SUNDAY except attending a Church without expressed permission from Staff Members. PRIOR to attending an OUTSIDE CHURCH and information sheet must be on file with the Program Manager. Involvement with guests other than those in the program, other than that which is necessary in carrying out your duties is expressly forbidden. (A Mixture for Disaster, Old friends, Old habits and Old places). Pilfering of any incoming donation will be viewed the same as STEALING! THIEVES WILL BE DISMISSED! Taking bulk clothes home while on the program is considered stealing as well. You must sign out and sign back in when you leave Mission property. You are to focus on YOUR PROGRAM, and not the program of others. Relationships with them, this include being invited to their Church or homes, taking money, gifts or asking for special favors. No immoral conduct will be tolerated. (fornication, adultery, or inappropriate physical contact between individuals. Electronic hand held games of any type must be turned in to the Assistant Director Office. These items will be returned when you depart the program or graduate. Upon being accepted into the program, cell phones have to be turned in to the Assistant Director Office. Program men can only be in possession of a cell phone while on their Days off. When they return from their day off, they have to turn in their phones as well as any other electronic device. On days off, cell phones are not to be used on the property. A program man cannot let another program man use his cell phone on the property. Nor can a program man use a guest or graduate cell phone on the property. If an emergency phone call needs to be made, the Program Manager has a cell phone for the program men to use. Electronic appliances, TV’s, radio’s DVD players, MP3 players, iPod or any other device that is in this category is not allowed in the Dorm. These devices must be stored with the Assistant Director and checked out on your day off. Christian Music and Talk is the only thing allowed to be listened to on any radios on Mission property. These radios are by permission of staff. These are subject to removal if anything other than Christian programming is listened to. Anyone listening to secular music/talk is subject to discipline, which may include a Yellow Badge. Plasma banks are off limits and no one is permitted to sell plasma or blood. Attendance at Friendship or Discovery Park is not allowed! Appointments, medical, dental, etc, should be conducted on your scheduled day off. If they cannot be scheduled in that fashion and they are lengthy, that day will become your day off for that week! No personal Bicycles are allowed. No personal vehicles are allowed or stored on Mission property. A Pastor must approve all personal reading and vocational material. Mission phones are for Mission business. Program men are not allowed to loan or give money to other program men, the homeless or staff for any reason. Do not ask anyone to go to the store for you for any reason. This includes program men on their day off. How the days starts out at the Mission for a Program Man. Every man is expected to attend these services. 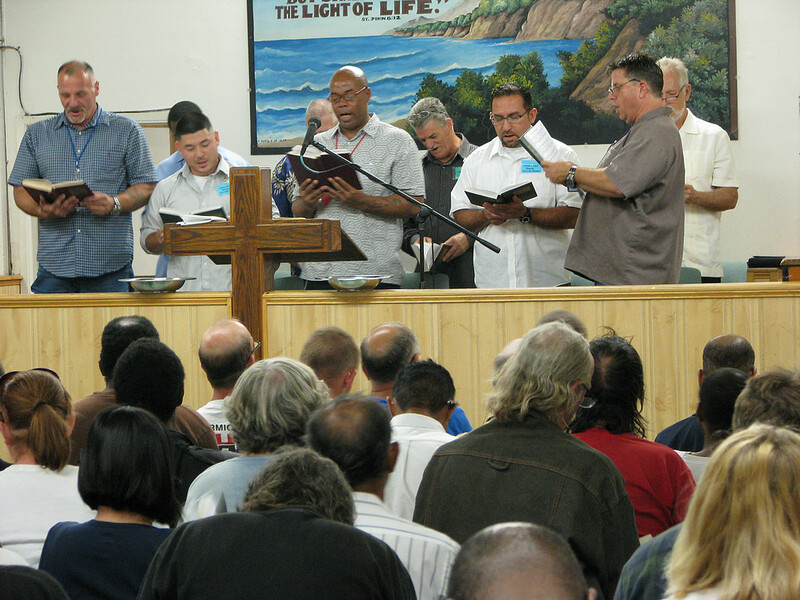 Men in the Program will be attending Chapel services, Nine times a week, twice on Friday and twice on Sunday. Every man in the Program has to attend counseling with a Pastor once a week!!! The Badge is worn around the neck at all times when permissible while on MIssion Property. Badges have to be fully in view so that Chapel Groups, Serving Goups, Staff, Guests and Donors know you are with the Union Gospel Mission. A Yellow Badge is a Disciplinary Badge. It is given to someone who has broken a Rule set forth by the Mission. You can only receive 2 of these in the 9 months. If you receive another you will be asked to leave. A Pink Badge is an Academic Probation Badge. The person has fallen behind in their studies or has failed to turn in work. If a program man receives a Yellow or Pink Badge he loses his privileges. Which are, he cannot leave the property on his day off, he cannot use the weight pile, he cannot use the phone, he cannot use the TV room or computer room. When a man comes into the program he starts out as a Red Badge. He is in what we call a Black Out period. He cannot leave the campus or have any contact with family or friends (except in emergencies). He can write letters to his family in which postage and materials are provided. During this 30 day black out you have to read, remember and pass the following. Once a person has completed the Red Badge stage, He goes to a Green Badge. Now he gets a day off, but days off vary with job. He can leave from 9:00 AM, after Bible Study class, and has to return no later than 2:45 PM. Once he comes in he will have to Test-In. In the Green Badge stage he now starts the 12 step process. in this process he has to complete step #1 and memorize the verse. Once he has done this, he stands before the class or the Pastor and recites step #1 and verse to move on to step #2. He will continue this process throughout the 12 steps. Once he has completed the 12 steps, he stands before the class or Pastor and recites all 12 steps and 12 verses in a row to move on to the Blue Badge. 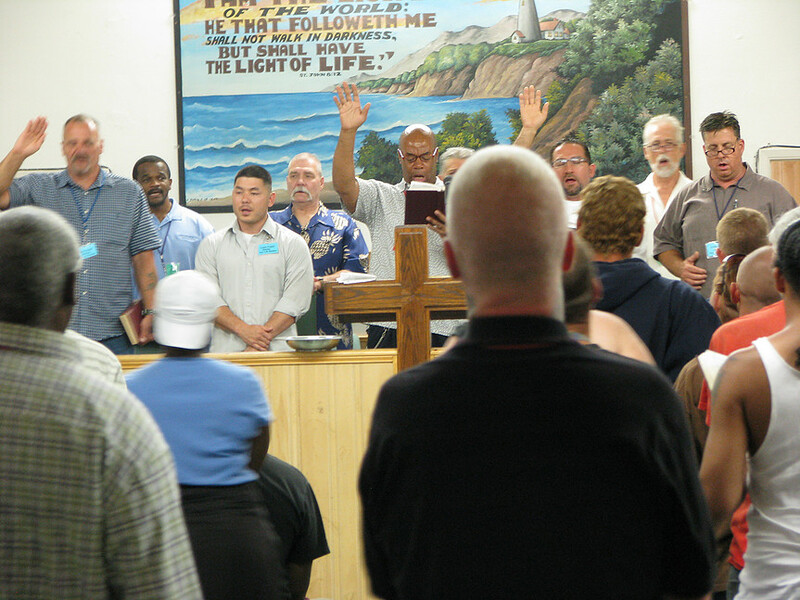 At six months a Program Man can find and attend a solid Bible believing Church on Sundays. Once a person has completed the Green Badge stage, He goes to a Blue Badge. He gets a day off, but days vary with job. He can leave from 9:00 AM but has to return no later than 9:45 PM. Once he comes in he will have to Test-In. He now starts the 4 packet Healing Anger. After this is completed he moves into the Genesis Process which is 10 Chapters. 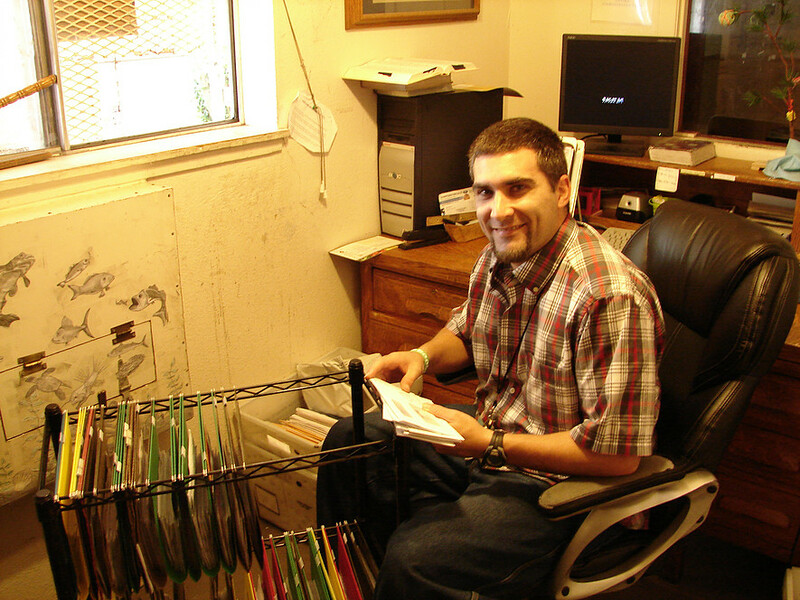 The last step after the Genesis Process is completed, He has to write 5 letters to the Pastor and these letters have to be approved. Once he has completed the entire process, he will have an informal graduation on the next Friday after he is completion. This is usually infront of Saff, Program Men, Family and Friends. We have a Formal graduation once a year with all the Program Men that graduated in the pryor 12 months. This is usually infront of Staff, Family, Friends, Donors and Pastors. * All food or drinks purchased must be consumed before returning back to the Mission, unless your purchase will be shared with every program man. * The cooks are responsible to respense the food. * You will be alerted by the ringing of a bell, prior to each meal and snack. * You must be present for prayer over the meal or you will not be allowed to eat. * The meal schedule is as follows. Shower and shave daily, keep your appearance trimmed and neat. See the Cage Man in the shower area for shaving gear and your showering needs. Proper footwear must be worn at all times. Shower shoes and thongs are permitted in the shower and dorm only. You must dress appropriately for Chapel; collard shirts are the ONLY SHIRTS ACCEPTABLE. All shirts with buttons must be buttoned up. Long pants must be worn. You must be present for prayer over the meal or you will not be allowed to eat. Program men receive clothing from the men’s clothing room while they are in the program. 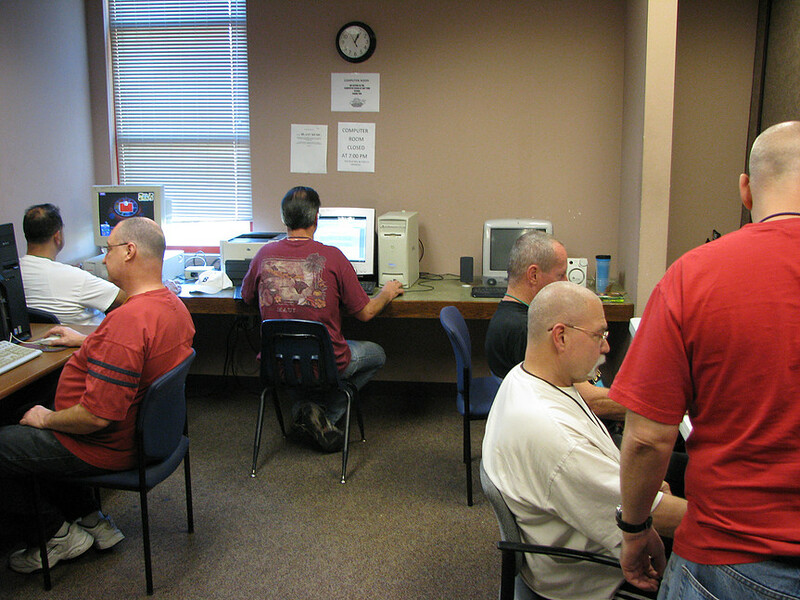 Clothing room will be open to the Program Men every Friday between the hours or 11:00 am to Noon. (1 hour) If you came in the program and in the need for clothes, you will be accommodated. Program men are not permitted to take home items obtained from the clothing room or warehouse without express permission from staff. Taking items home without permission will be viewed as stealing and could result in corrective action up to and including dismissal. All clothing and personal item are to be contained within your locker and drawer under bunk. 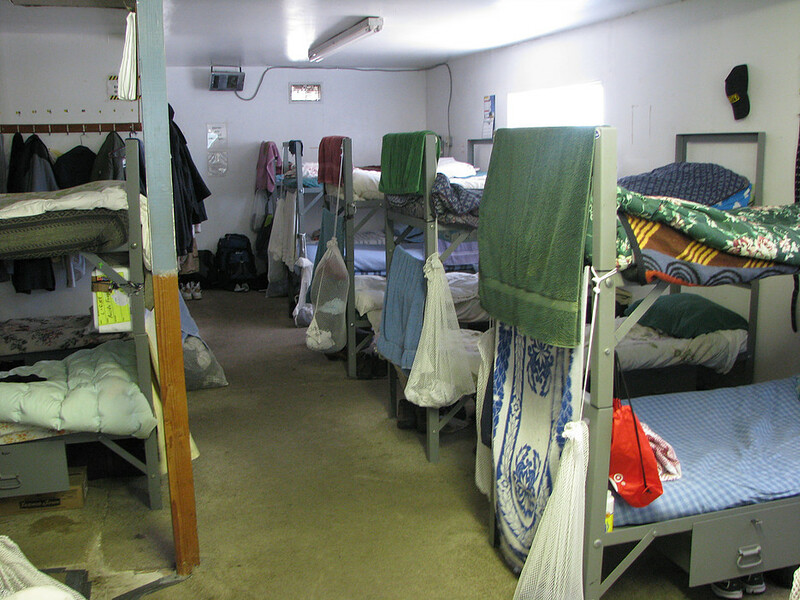 Shoes and laundry bags can be stored under your bunks. The laundry room will wash, dry and return your laundry to your bed. Your bunk number on your bag should match your bunk number. You will have an assigned laundry day to take your laundry down and drop it off. Only two (2) towels are permitted from Mission supplies and are to be laundered as needed. A towel may be hung at the foot of the bed. Coats are to be hung on the wall on the hooks provided. Your hook number will match your bunk number. If you leave the program for any reason you must take all of your belongings with you on the day of your departure. If you fail to take everything with you, in 10 days, your property will be recycled back into circulation. The TV Room is open to Program Men only! No guests are allowed in the TV Room at any time. There is no excessive conversation in the tv room. This only distracts others when a tv show is being watched. There is no eating in the tv room, snacks, candies or food. There is a strict adherence as to what is watched on the UGM TV. There is NO TALKING or SOCIALIZING IN THE DORM ROOM!!! (zero tolerance) The Dorm is an area to sleep and relax QUIETLY! All program men are to be in the dorm from Midnight, 12:00 AM to 4:00 AM. Only the night man is to be downstairs. Dorm lights out at 10:30 PM every night, 7 days a week. Nothing is to be hung on the dorm walls except the hooks for the jackets. No makeshift bed curtains or tenting allowed. 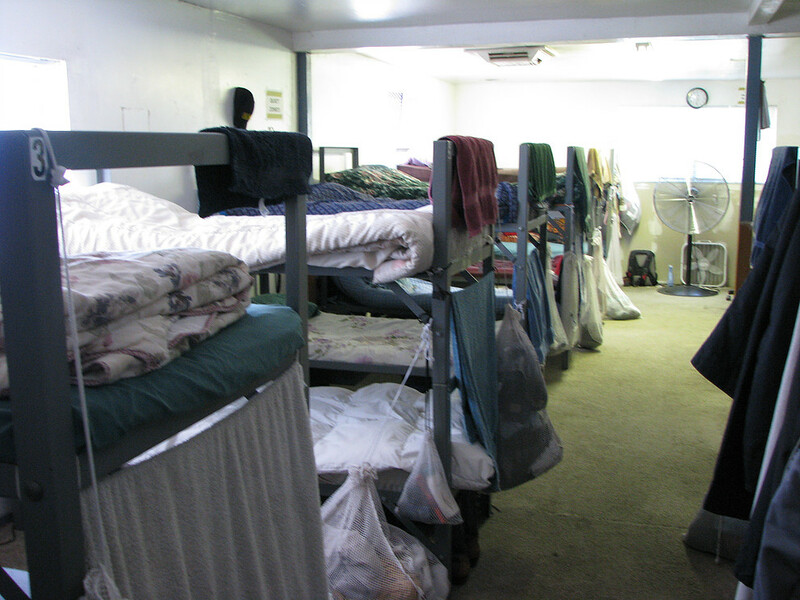 Everyday, beds are to be made before going to morning Bible Study. Beds are to be stripped and linens washed on your wash day. ALL MEDICATION INCLUDING ASPIRIN ARE TO BE STORED IN THE MEDICINE CABINET. NO MEDICATIONS THAT ARE TAKEN ORALLY CAN BE STORED IN DORM LOCKERS. ITS A VIOLATION OF FEDERAL LAW. Program men are not allowed to eat or store and food or candy item in the Dorm Area or in their lockers. This is to minimize any bug or mice problem. No radios or cell phones are allowed in the Dorm area. Program men are issued locks with their locker, and then you are responsible for that key and locker. 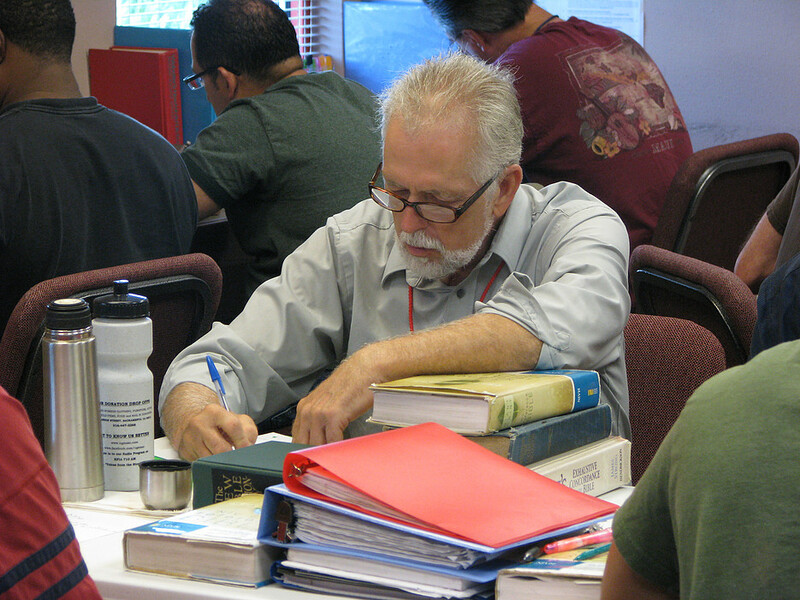 Every Man is assigned a job to help assist in the daily operations of the Union Gospel Mission. One of these jobs will be assigned and the program man is accountable to be at that job during its hours. It is your responsibility to KNOW these policies and procedures. You will be tested. We hope that your stay will be the beginning of a long fruitful walk with the Lord Jesus Christ.